For some reason my skin has been freaking out lately with blemishes and I have not been able to pinpoint what it is that’s causing it. Diet? Using my Clarisonic too much? Anyway, I was waiting to it to calm for a minute so I could try this SOMME INSTITUTE Boost Gentle Warming Mask but hey, why wait? This one could actually help, duh! This is one of those warming masks, which sometimes give me the creeps but it doesn’t get too warm like some I have tried in the past. Like all of their products, this one is infused with their patented MDT5 (Molecular Dispersion Technology), which is a complex of 5 highly engineered vitamins (A, B3, B5, C and E) and proteins to really smooth out skin. And I love that it also contains natural pumpkin enzymes, to help clear out dead skin on the surface. And I read in their materials that the warming is due to the Zeolite, which is a natural mineral the opens the pores enabling the Kaolin to absorb oil, dirt etc and free radicals can’t survive it. So it’s like a skin crime fighter! The verdict? I’ve used it 3 times now and while I’m not usually big on using face masks, I really do like this one not only because you only leave it on for 5 minutes but also for what it leaves behind afterward, which seems to be calm skin and a feeling of a neutral pH, not dry and tight. And the fact that it has major anti-aging ingredients? Major double, or rather, triple duty benefits. Big recommendation. $40/3oz @ dermstore.com, bloomingdales.com. We wrote about the SOMME INSTITUTE some time ago and for the life of me, I can’t recall which product it was. I know it for sure was not their Transport ($58/3oz @ nordstrom.com) because I probably won’t forget this one now that I’ve experienced it. I sometime feel like scrubs with the granules are too rough for the skin on my face so I know I will be reaching for this one on occasion as an alternative. 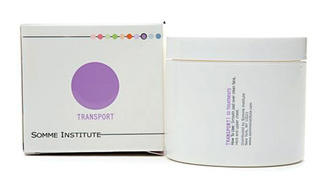 Each pad in the Transport container is steeped in a combo of alpha and beta hydroxy acids to chemically exfoliate the skin and like all their products, this one contains their Molecular Dispersion Technology 5 or MDT5 ingredient. They claim this blend of vitamins A, C, E, D, B3 and B5, has been proven to produce visual changes in skin texture, tone, and clarity. Because of this unique biochemical complex, it’s able to penetrate the skin deeply without oxidizing or losing potency. And they have some impressive validation from dermas and researchers at prestigious Universities to back up their claims. Hmmmm, so there are the facts. I don’t know how long you are supposed to use this to see the results but typically it’s about 6 weeks. So while I’m just getting to that mark, I am digging the way it exfoliates my skin, which is good enough for me.